I spent an interesting day mapping the WW 1 training trenches on the outskirts of Ipswich. 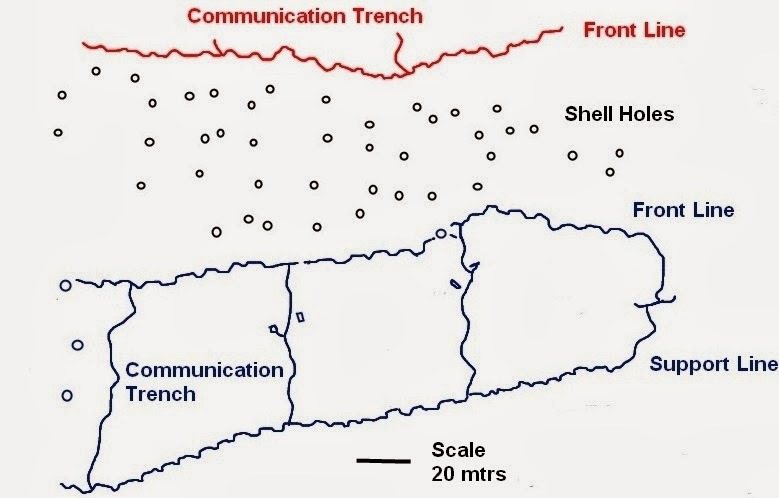 They appear to represent opposing trench lines; the line that has survived the best consists of a front line and support line linked by communication trenches. On the other line, the front line survives but the rest of the system has mostly been infilled, as it runs through the nearby golf curse. 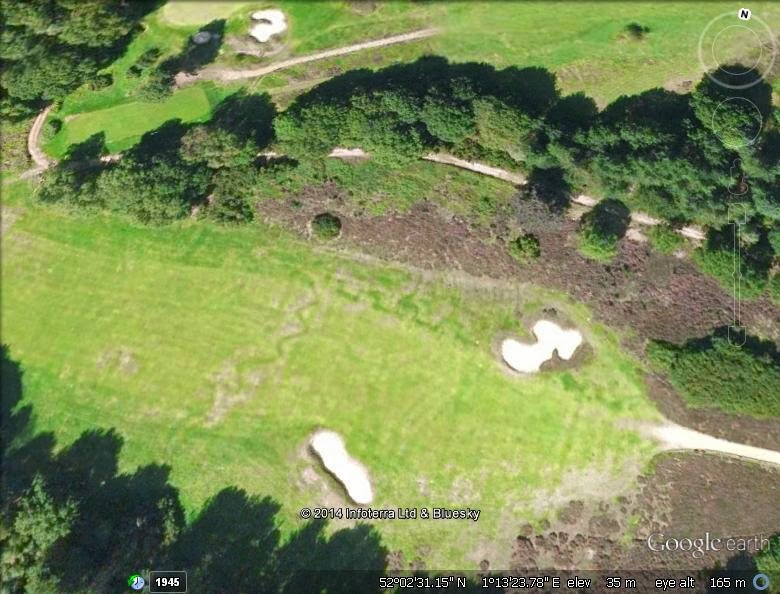 The outline of part of the system can still be seen on the green! Above: GPS plot of trenches and shell holes near Ipswich. Some shell holes may have been missed due to thick bramble and gorse scrub in places. The front and support lines consist of short fire bays with traverses. The purpose of traverses was to give protection against enfilade fire and to localize the effect of a bomb or shell bursting in the trench. This gives the trench line the familiar crenelated pattern seen in WW 1. The communication trenches follow a more sinuous line, meaning transverses were not required. In places the trenches are still remarkably well preserved but along some stretches they are beginning to blend back into the land. 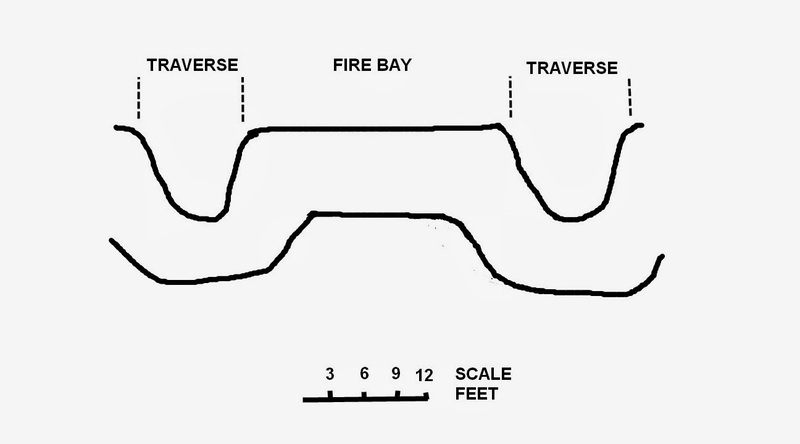 Above: A front line trench were the fire bays and traverses can still be clearly seen. Other parts of the trench system are as well preserved in places, although covered in bracken, bramble, gorse etc. "No Mans Land", the ground between the two opposing lines, is pitted with shell holes. I must admit I am not familiar as yet with the degree in which live firing training took place in WW 1 - the shell holes could be 'mock' to present an accurate replica of the battlefield. Training pamphlet "Instructions for the Training of Platoons for Offensive Action", 1917 does say however state: "Live ammunition: No form of instruction with arms can be considered complete until it has been carried out with live ammunition under conditions as nearly as possible approaching those which would pertain on the battlefield". It is probable training took place at platoon , company and battalion level, perhaps even brigade level on this site, with troops practicing trench attacks, advancing in waves etc. Above: Shell holes - note the meter ruler in the bottom photo for scale. In the best preserved line (the blue line on the trench map attached), there are a few saps running off the communication trenches, one appearing to end in a 'T Head' ('T Heads' and 'D Heads' were often incorporated in communication trenches as fire posts). Another seems to end in some sort of weapon-pit. There is a large pit in the front line - perhaps a dugout? 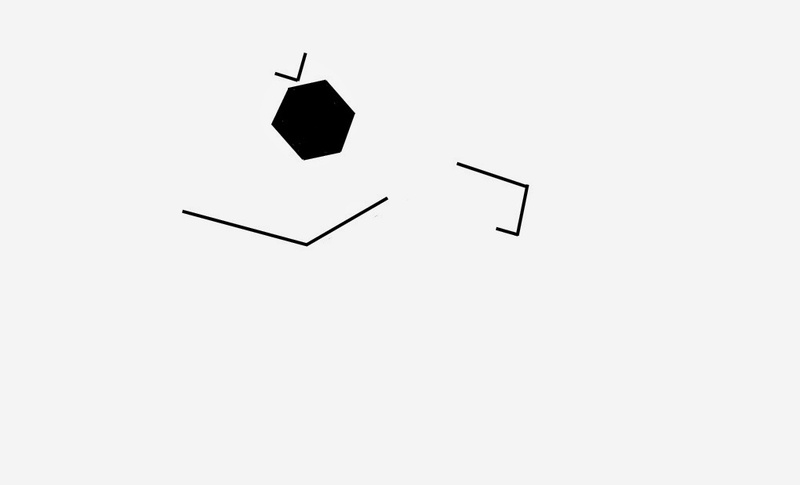 There are other pits, for which I am uncertain of what they were supposed to represent. There is a single earthwork which looks like a WW 2 slit trench (6' x 2' dimensions) - it is not beyond the realms of possibility the trenches were also used in WW 2 for training. This weapon-pit is at the end of a sap running off one of the communication trenches. Surely the revetment in the image does not date from WW1? But then when does it date from! An interesting find was the remains of a .303 cartridge - manufacture was Royal Laboratories and the date 1917. This at least indicates some sort of live firing took place. Remains of a .303 cartridge, dated 1917. It has been fired. 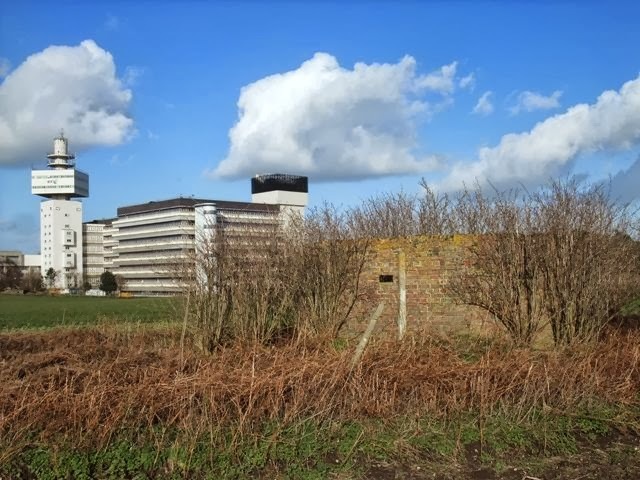 RAF Martlesham Heath Defences - soon to be lost? I have visited these defences a few time, all that now remains of the defences of RAF Martlesham Heath, but learning that the site is included in the plans for thousands of new homes at Martlesham, I decided to record the remains in a bit more detail as it is hard to see them being preserved if the Planning Permission goes ahead, which is likely. The following posts includes the recording on this visit plus some images from previous visits. 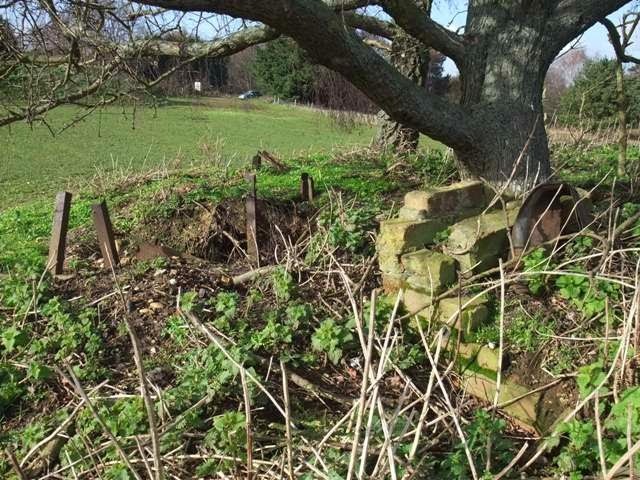 The site includes a Type 22 pillbox, Type 23 pillbox, remains of a building with a loopholed wall and remains of weapon-pits / slit trenches. 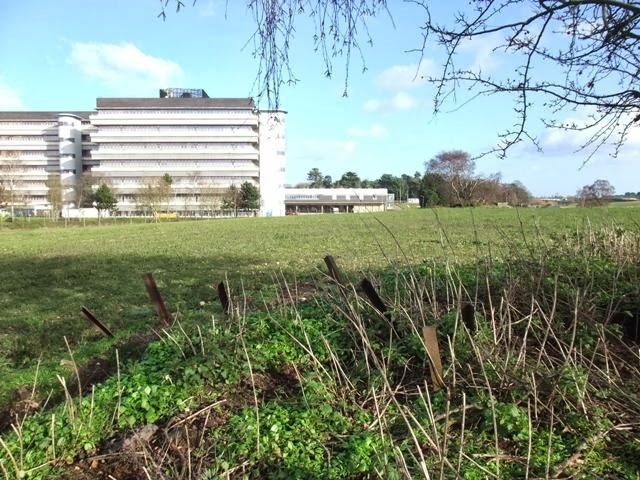 It was once possible to see the pillboxes as you drove past on the A12 but a bank now screens the field from the road; not sure if this is to do with the planned houses or screening the nearby quarry. Anyway, one building has been destroyed with building a bank in the field. 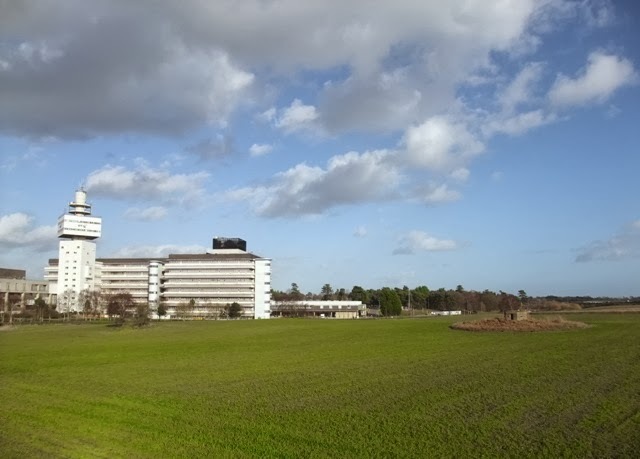 Above: The area today, soon to be part of a housing estate? 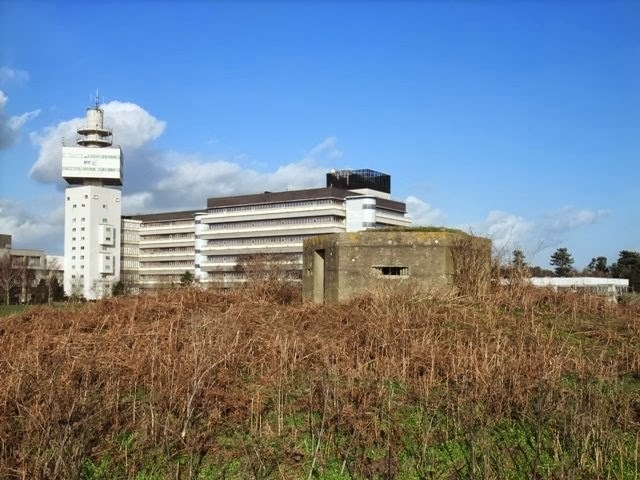 Type 22 pillbox: A very good and clean example. 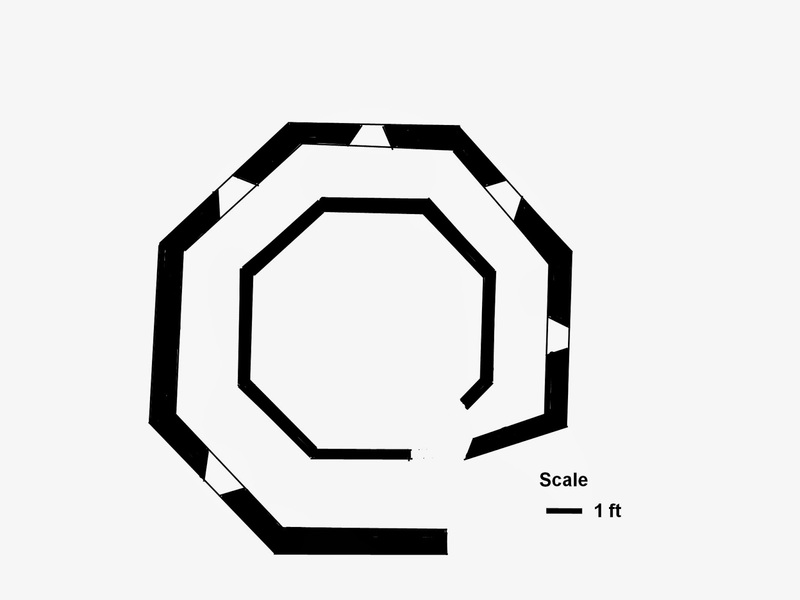 It is built on a mound (tumulus?) presumably to give it a commanding position. There are also remains of brick walls on the mound, one which seems to run partly way round the base of the mound (remains of brick lined trench? ), one possibly the remains of a shelter. Above: The Type 22 pillbox. 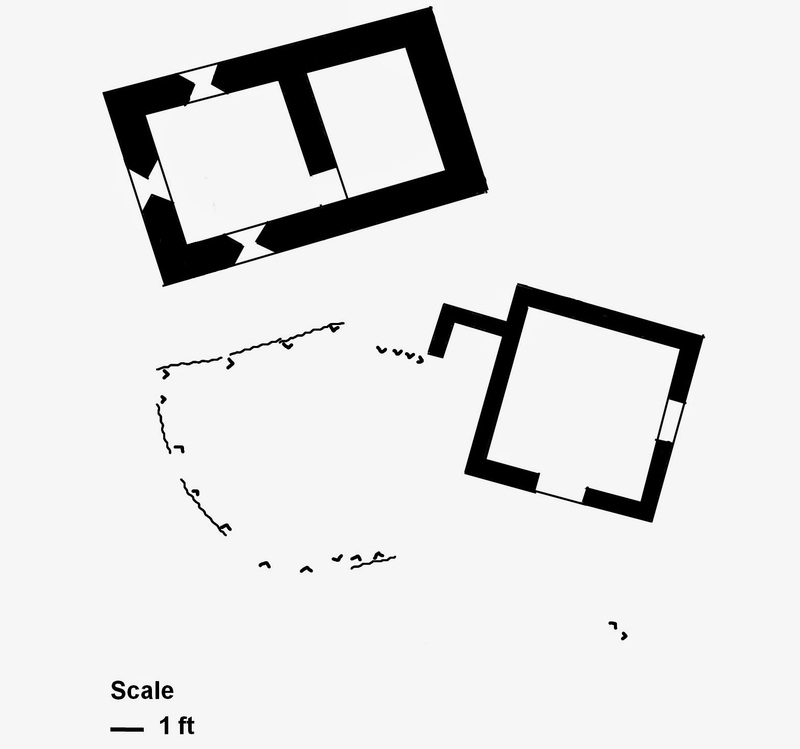 Bottom image is a plan showing the pillbox and remains of brick walls. 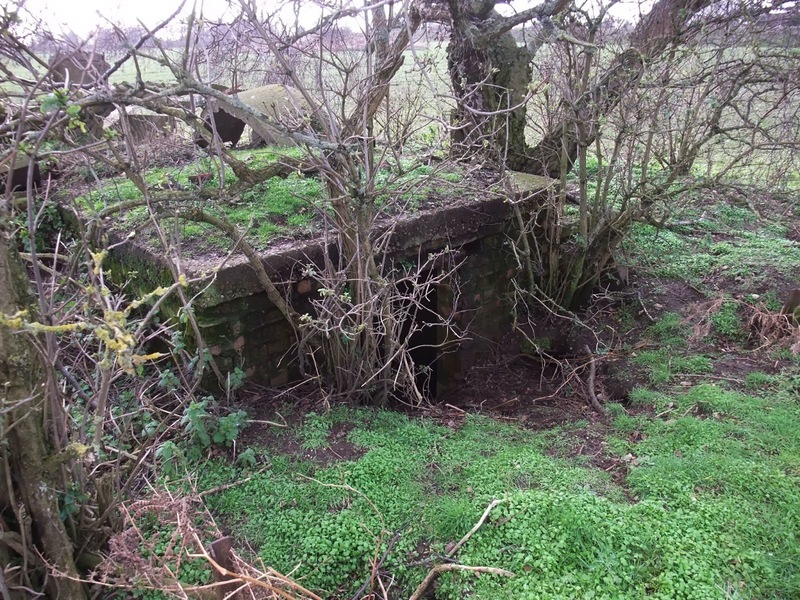 Type 23 pillbox, dugout and slit trenches: A Type 23 pillbox is associated with a brick built dug out and remains of weapons-pit/slit trenches. The pillbox is sunken to embrasure level. The dug out is of a “cut and cover” type, constructed with brick (9” thick walls) and has a 6” concrete roof. There is what seems to be a window in one side of the dugout at ground level. The entrance has the remains of a 3” wooden lintel. The dimensions of the dugout are virtually identical to the dugout at Hethel in which I recently posted about. Perhaps the defences developed over time, the dugout and slit trenches added later than the pillbox? If so the question remains why place them so close to the pillbox, which would draw attention to them? If this was the case the answer is probably that the pillbox was located in the ideal fire position. 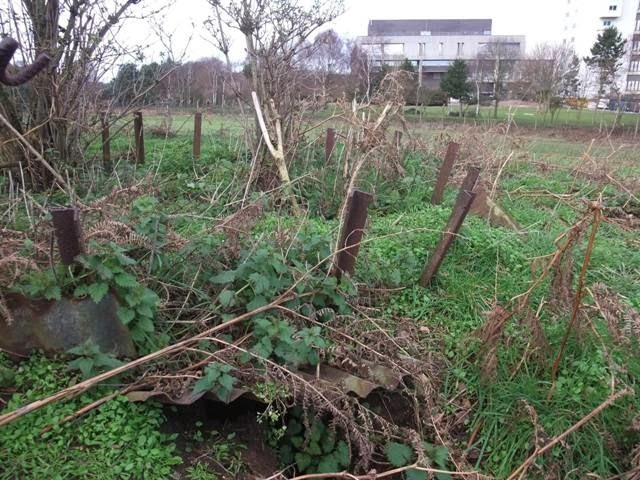 The remains of the slit trenches consist of angle iron and corrugated iron sheet revetment. The remains of what is probably another dugout and associated slit trenches are nearby. Above: Top image shows plan of Type 23 pillbox, dugout, angle iron pickets and corrugated sheet revetment. 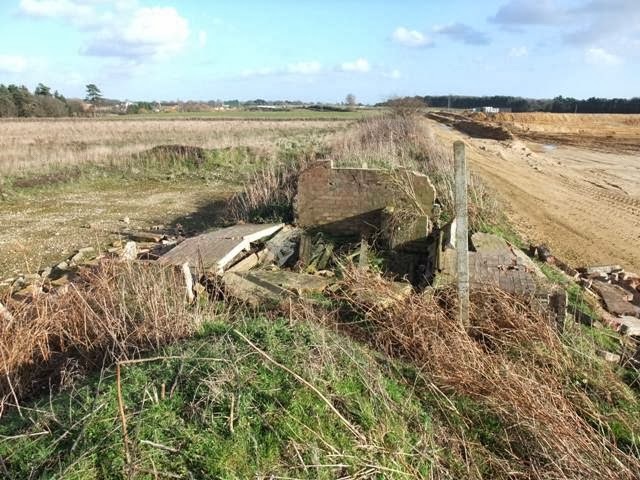 2nd image shows Type 23 pillbox - note the remains of a Stanton Air Raid Shelter dumped on top. 3rd and 4th image shows the remains of the slit trenches; image no 4 was taken a few yrs ago, note how much better preserved the corrugated sheets and pickets were then. 5th and 6th image show the dugout. 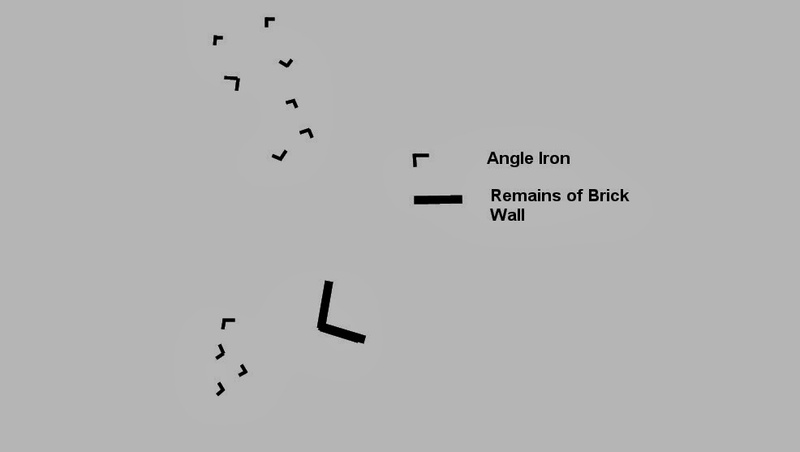 7th, 8th and 9th image show plan and images of the remains of a second defence position nearby, probably consisting of a "cut and cover" dugout and slit trenches. Defended building: Remains of the foundations of an octagonal building given an outer skin brick wall which is loopholed on five sides. Not sure what the building was used for. Above: Sketch and images of loopholed building. The last three images were taken several years ago, just after the scrub had been cleared from the remains. Destroyed building: Not sure what the purpose of the building was. Above: Destroyed building, as it was a few years ago and today. Finds: Finds in the field nearby the defences included some period pottery and a charger clip for loading a rifle although not sure which rifle (not a .303); maybe post war.